Photo of the day: THREE FIERCELY INDEPENDENT WOMEN: My three ‘moms’. Each woman went against the society of her times and lived her life as she saw fit, not as society dictated. I am these three women. If you love me – you love them. Anny Cornelius: My theatricality, musicality, passion, humor and style. Against all dictates of the day, she refused marriage offers from royalty and fine suitors and ‘married’ her opera career to wind up singing Carmen at The Berlin Opera. Amahlie (Jaehne) Von Rittern: Divorced her husband to raise her child as she saw fit. Later gave up her concert pianist career and country to come to America (not knowing the language) to help raise me. My appreciation of music, love, compassion and sense of art and balance come from her. Ursula Von Rittern: Divorced her husband to raise me on her own. Refused alimony in the 1950’s and did it all by herself. She went from selling vacuum cleaners to California residents in the early morning on the telephone to finally breaking through the sexist glass ceiling of the 1970’s and 80’s and wound up in a corner office, assistant to the CEO of Manufacturer’s Hanover Bank. My liberal views, determination and hard work ethic come from her. I am these three women. 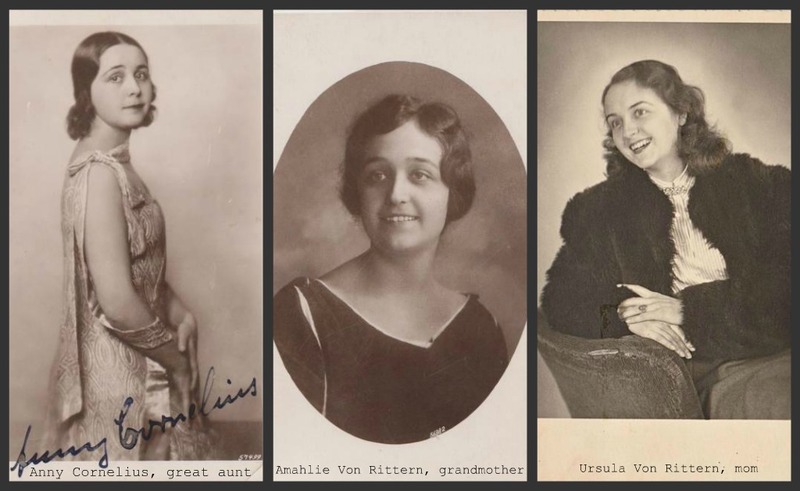 In the works is a family history of four generations of independent women who all raised their children on their own against all odds, through two World Wars, traveled around the globe, sacrificed, fought sexism and society’s morals. Mom is 87 and currently writing the book. Stay tuned . . .